Our rebuilding fundraiser is going well thanks to the nice people at Fortis. Being a CHAPS Volunteer isn't about how long you've lived here. It's about contributing to the community, meeting new people, learning new skills and having fun. Builders. We can’t thank the folks enough that helped to build CHAPS. Our apologies if we've overlooked someone. We’ve reviewed our list quite a few times so that we don’t overlook anyone's contribution. We apologize if we’ve accidentally overlooked anyone. If we have, please let us know so we can amend our records. We can match your skills with our needs. 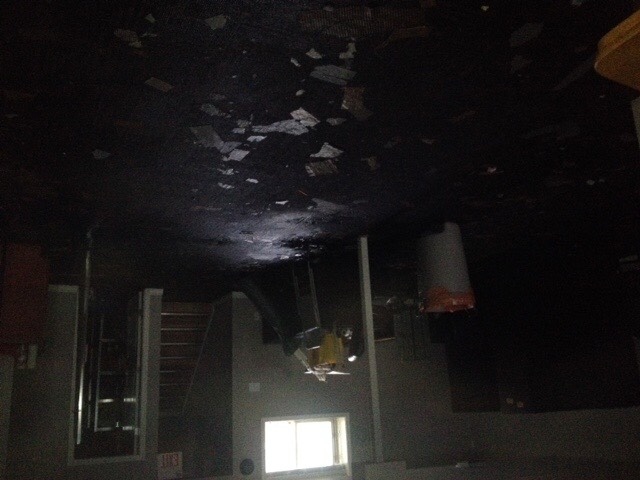 Sadly, the museum was damaged. 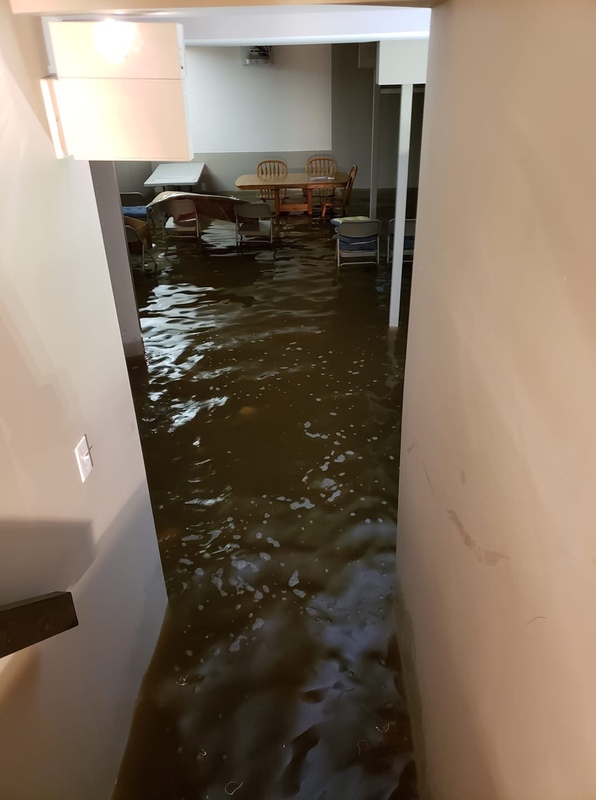 Thanks to all who assisted. Beaupre – a locality north of the 1A Highway about 10 miles west of Cochrane. Named after Louis Beaupre, an early settler who bought squatter’s rights there. Beaver Dam Creek – rises in the west side of the Weedon district, flows through Mortimer Coulee, and winds on northeast. So named because of the numerous beavers in it. Big Hill – the hill below which Cochrane is situated. Early maps show it as Manachaban Hill, which is the Blackfoot name. The apex of the Big Hill is about 3 miles east of the town. Bow River – so named because the Indians obtained wood for bow making, along its banks. Cochrane – situated on the southwest slope and at the base of the Big Hill. Named after Senator M.H. Cochrane (1823-1903) who established the Cochrane Ranche in 1881. Cochrane Lakes – named after W.F. Cochrane, son of Senator M.H. Cochrane of the Cochrane Ranche Company. The lakes are 4 miles north of the 1A Highway, and west of Highway 22. Dog Pound – a locality which derives its name for a Cree name. but its origin is not clear. Presently, it is a hamlet on the Crossfield – Cremona Highway. 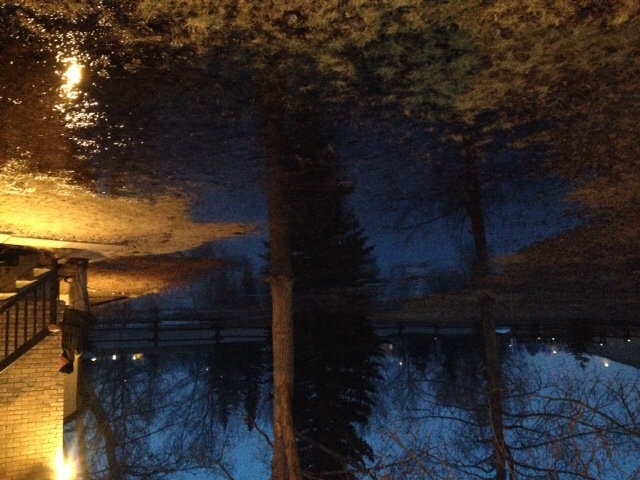 Ghost Lake– the flooded area formed by the Ghost Dam. There is now a village on the north shore of the lake. 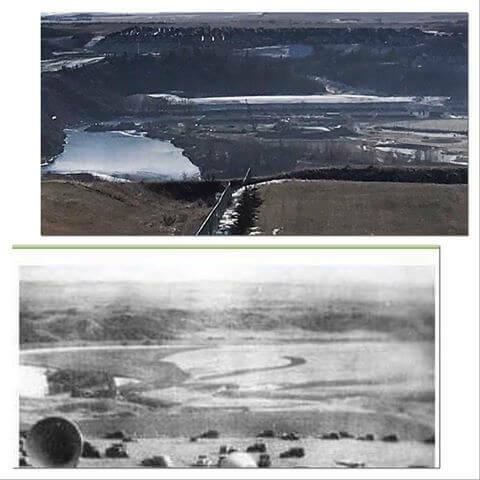 The Ghost River flows into the Bow just above the Dam. 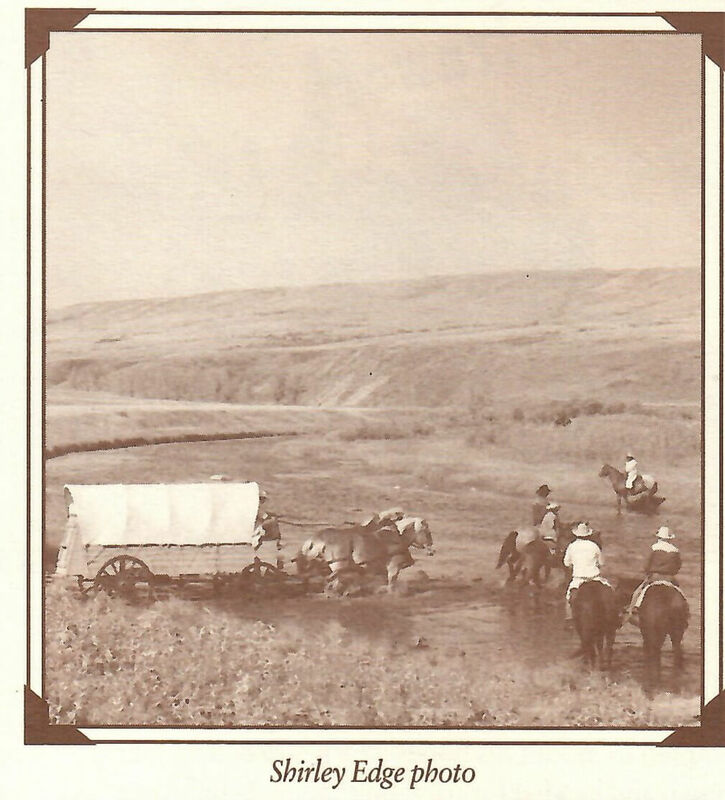 Horse Creek – supposed to have been so named because of a lost horse which was found drowned in the creek. 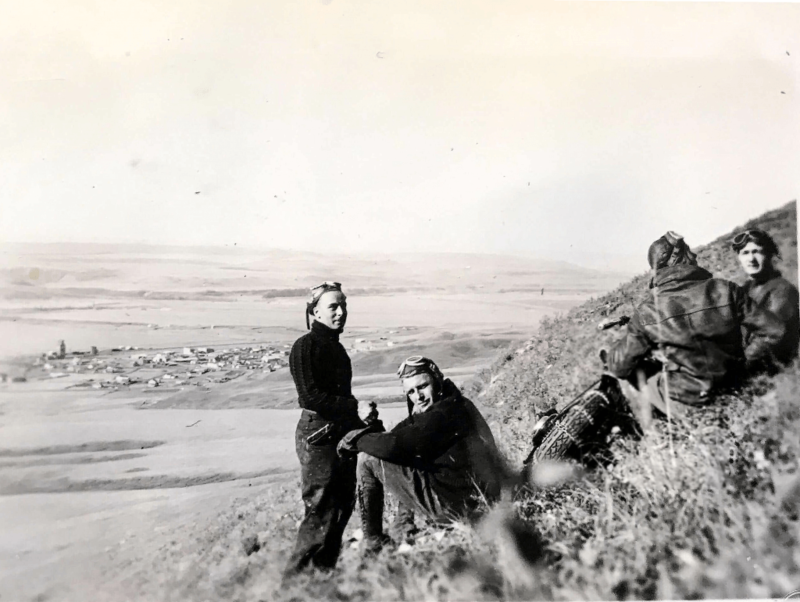 Jackass Canyon – located northwest of Beaupre. When the C.P.R. came through in the 1880’s, mules were used for building the roadbed. Those mules were wintered in this canyon, hence the name. Jacob Creek – named after a Stoney Indian Chief who signed Treaty no. 7 in 1877. It flows through the Ghost Dam Reservoir. Jumping Pound – a locality south and west of Cochrane. Lochend – a locality 14 miles northeast of Cochrane, named by J.K. Laidlaw. Lochend Lake – named by J.K. Laidlaw , and derived from the Gaelic name meaning “At the end of the lake”. Madden – a hamlet named after Bernard Madden, an early settler in the Beaver Dam District. Manachaban Hill – the Blackfoot name for what is more commonly know as Big Hill. 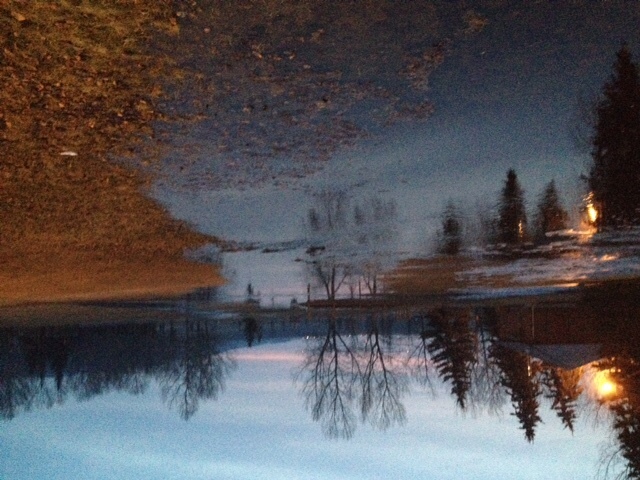 Mitford -a town between Cochrane and Morley on the banks of the Bow River. Mitford was named by Lady Adela Cochrane after her friend, Mrs. Percy Mitford. The town was abandoned when the C.P.R. 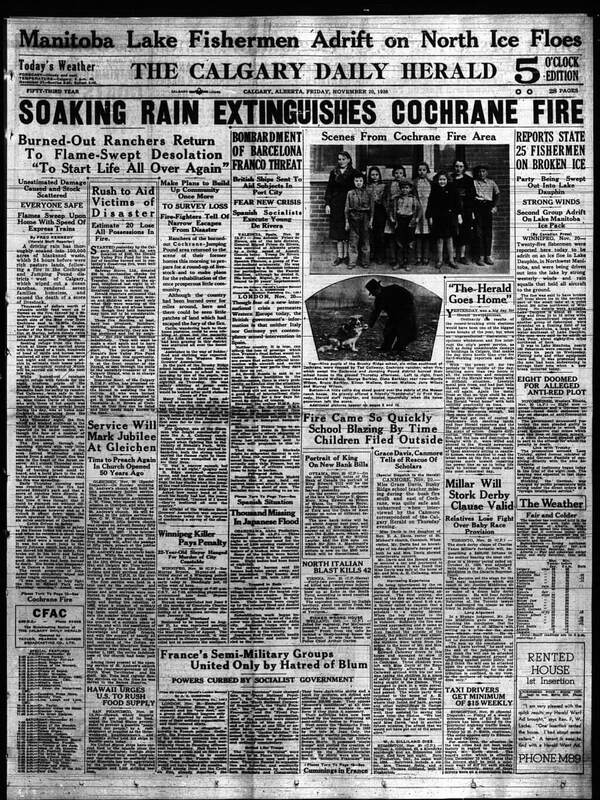 established their station at Cochrane, and later a fire burned the buildings that remained; some, such as All Saints Anglican Church, were moved to Cochrane. Morley – an Indian Reservation. Established as a mission at Morleyville, by the Rev. George McDougall. Named after Rev. Morley Punshon. 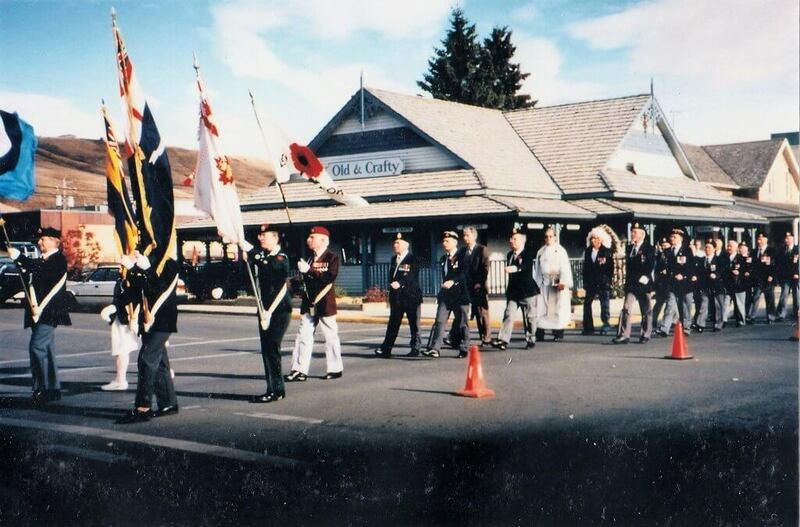 Radnor – a flag stop station on the C.P.R. just east of the Ghost Dam. Named in 1884 after Wilma, Daughter of the 5th Earl of Radnor. Sheep Ranch Hill -the hill just west of Cochrane, so named because the sheep corrals were at its base. Presently its known as Cochrane Crescent. Sibbald Creek – named after the Sibbald family who homesteaded in the area. Wildcat Hills elevation 5,135 feet; a range of timbered hills northwest of Cochrane. Thanks to Sonia Turner who originally wrote this article. This article contains a small number of the locations described on page 21 of Big Hill Country. I’d originally thought about updating the article but that changed the flavour and doesn’t show how much Cochrane has changed since the book was published in 1977. The Hooves of History was a fundraising event for the Western Heritage Centre to celebrate our western culture. I spoke with Ken Aylesworth, Steering Committee Chair, President and CEO of the Western Heritage Center about his memories. 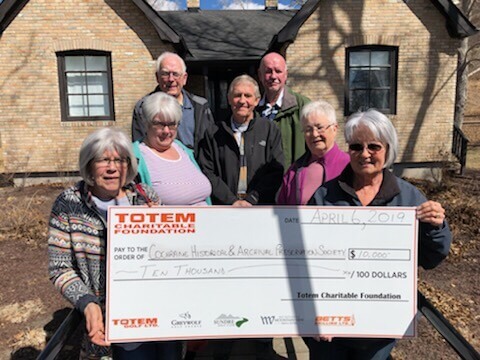 The goal of the event was as a fund raiser to establish an annuity to support the operation of the Western Heritage Centre. The original goal was to have 2000 head of cattle driven by 1000 outriders. 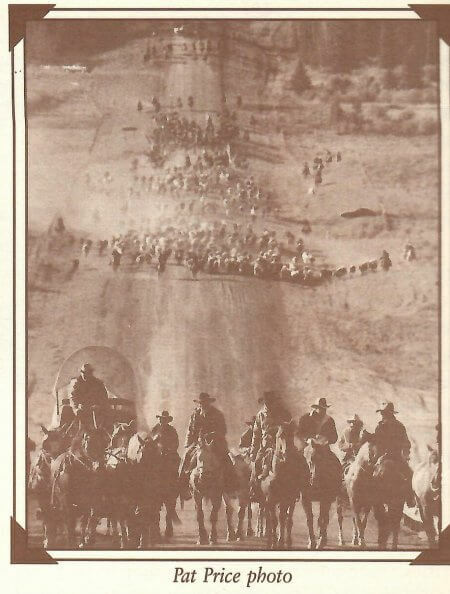 While that ambitious goal was not reached 1000 cattle and 750 drovers made the 55 km ride from Sibbald Flats near the Trans Canada Highway into Cochrane 4 days later. The drive stopped for nights at a Campground, Tom Copithorne ranch and the last night at the Wine Glass Ranch. Neil Sanger and Maureen Tynan were married that night on the Wine Glass Ranch by Cowboy Poet Doug Richards along with 50 guests. A team of volunteers was out front of the drive taking down ranchers fences and pounding posts to tie up horses at every nightly stop. The route was selected because land owners allowed the drive to cross private property many times providing the necessary insurance as well. While in Cochrane, the cattle were auctioned off, a dance was held in the Western Heritage Centre parking lot, outhouse races took place, stage entertainment including a western shootout, and a Cowboy Church. 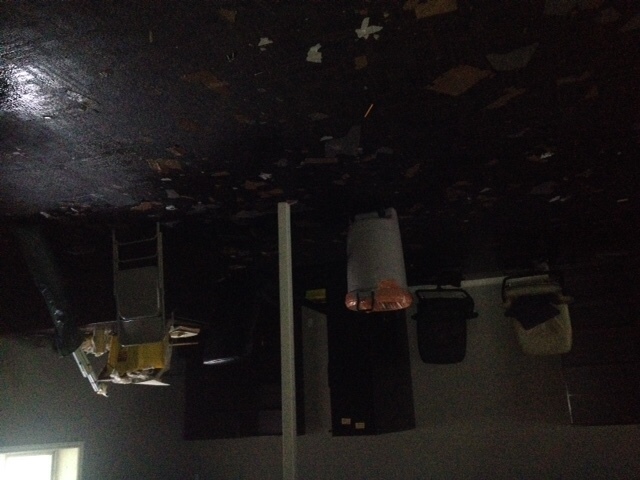 Ken says it was a big, big job requiring nearly 400 volunteers. Jim Bates was responsible for feeding nearly 2000 riders, volunteers and media personnel. 30 Volunteers helped serve food along the drive and another 30 prepared daily boxed lunches. Jim says the meals were not exactly gourmet cuisine but there’s nothing quite like a hot meal cooked on the open plains. By the time the ride is complete, Bates will have served 4,000 lbs of beef, 4,800 lbs of potatoes, 24,000 eggs, 1,500 lbs of bacon, 12,000 buns, 500 lbs of butter, 72,000 creamers in 35,000 cups of coffee and 6,600 boxed lunches. People attended from around the world including the rest of Canada, England, Australia, Norway, Holland and many parts of the U.S. Ken estimates 30% of people attending were not from the area. 10 wagons followed the drive. Besides saddle sores, there was only one injury. 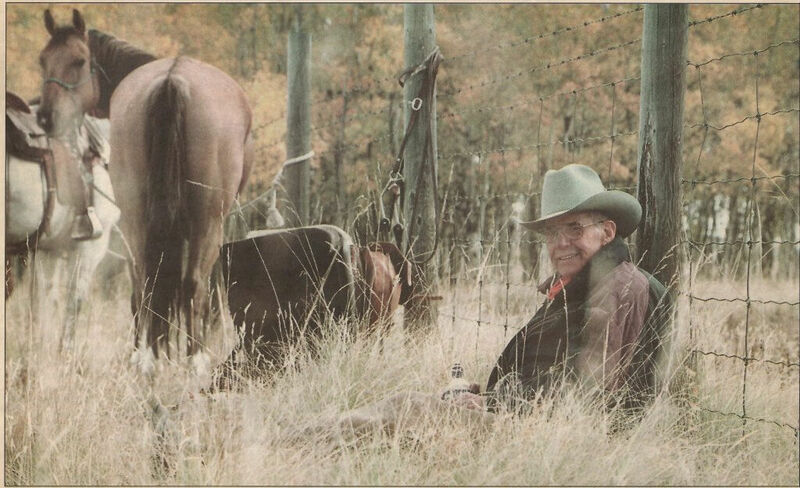 Ken’s dad Bob Aylesworth was thrown from his horse minutes from the start breaking his pelvis. "The day we came down the hill to ride through Cochrane was very emotional. 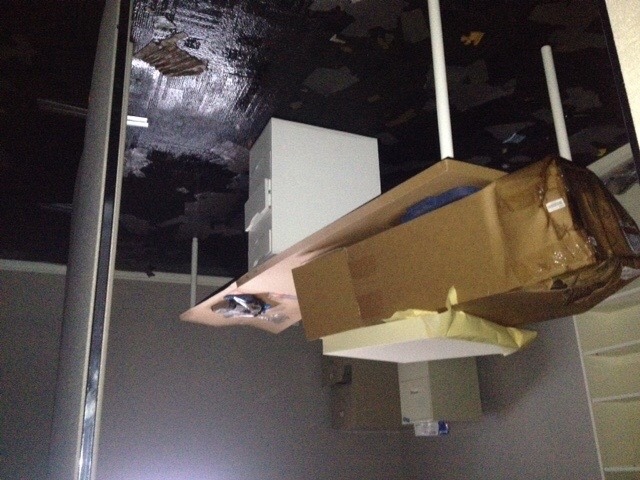 All this work and we were coming to the end of it all. The streets were lined and people were on the roof of the bar. It was a lot of work and a lot of fun." Hooves of History created a wonderful event for Cochrane. Media from around the world were here. 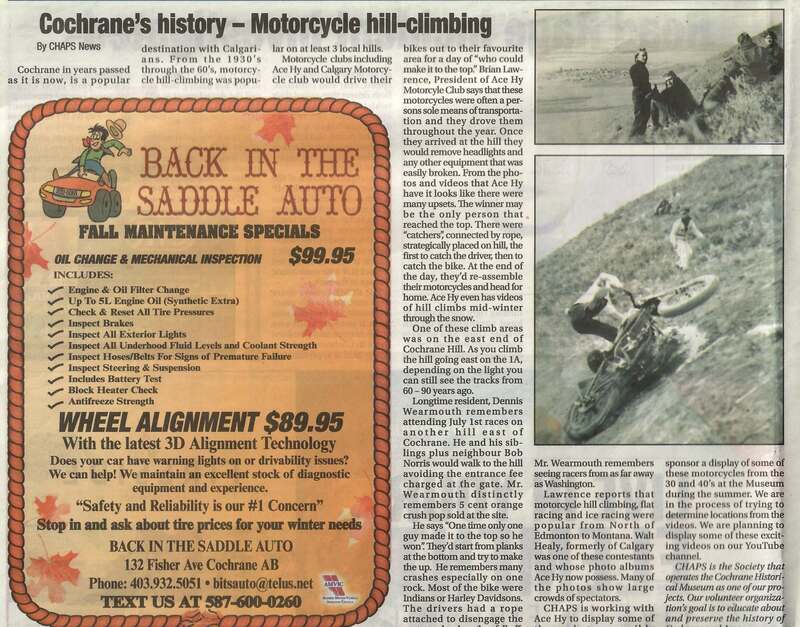 Thanks to Ken Aylesworth, the Cochrane Times and the Cochrane Historical Museum Archive for providing details of Hooves of History 2000. Phyliss Hart talks about how her father, Hedley Hart brought ice cream to his drug store in 1934 to bring people into the business. The video “The Five Cent Article” is from the series 100 Stories for 100 Years produced by Barry Thorson. 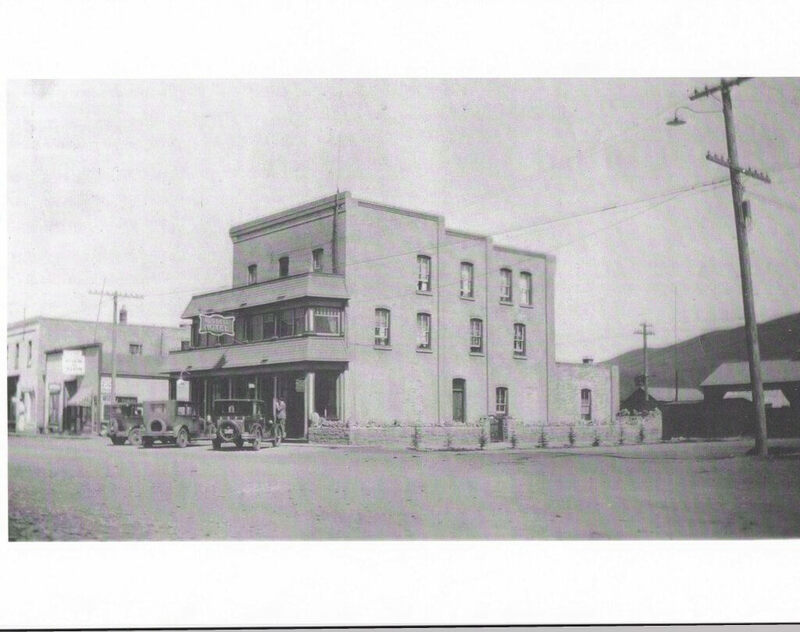 Hedley Hart purchased the drugstore from Dr. Waite who often closed the business when he had calls in the country. 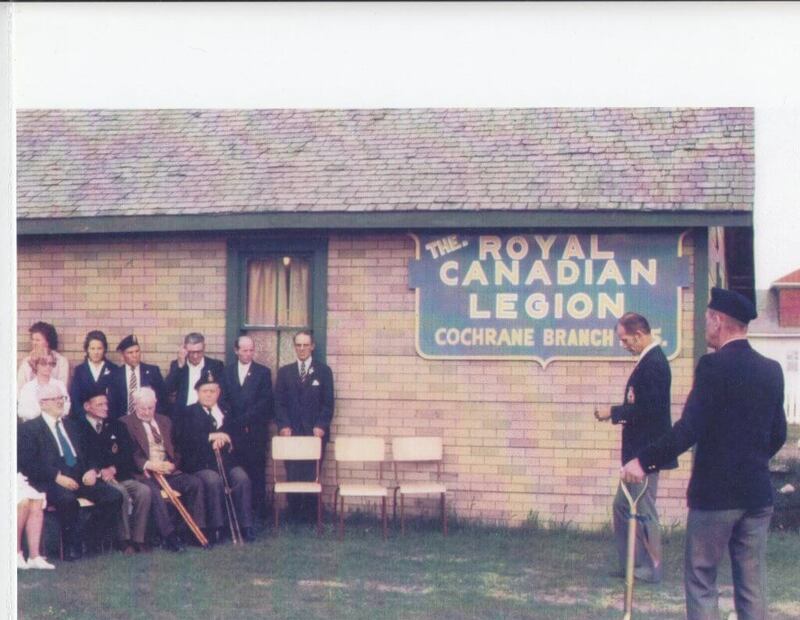 While business in Cochrane was better than in Gadsby, AB it wasn’t enough to support a family. One day, Max Thibodeau, with Union Milk and Crystal Diary in Calgary came in to sell an ice cream machine and everything to go with it. Thibodeau must have been quite the salesman or visionary to sell $1500.00 of equipment when ice cream sold for just .05 cents. It didn’t take long before the name was established and Hedley was staying up until 2 AM to keep up with the ice cream demand. He purchased a couple of new machines to help out. It wasn’t long before it became a Sunday pastime for Calgarians to drive to Cochrane for a Hart’s ice cream cone or a thick shake. The store was an agent for Brewster, later Greyhound Bus Lines. Bus drivers would buy ice cream and it wasn’t long before passengers did the same. At the time, Cochrane was on the Trans Canada and ran right through Cochrane. It wasn’t until years later that the Trans Canada Highway was routed miles south. In 1956, Hedley Hart sold the drugstore and ice cream business to Bob and Alice Graham. Hedley Hart, then 70 retired with family to Calgary. 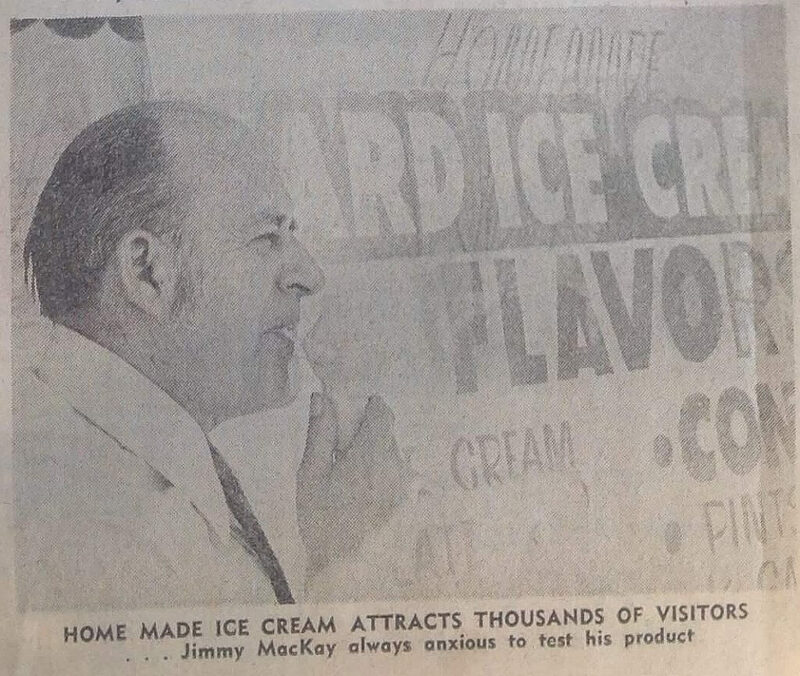 A year later, the Trans Canada Highway was developed south of Cochrane and the Grahams decided to sell the ice cream business to Jimmy MacKay. from files supplied by Phyllis Hart. Photos of the pre – 1975 Memorial. 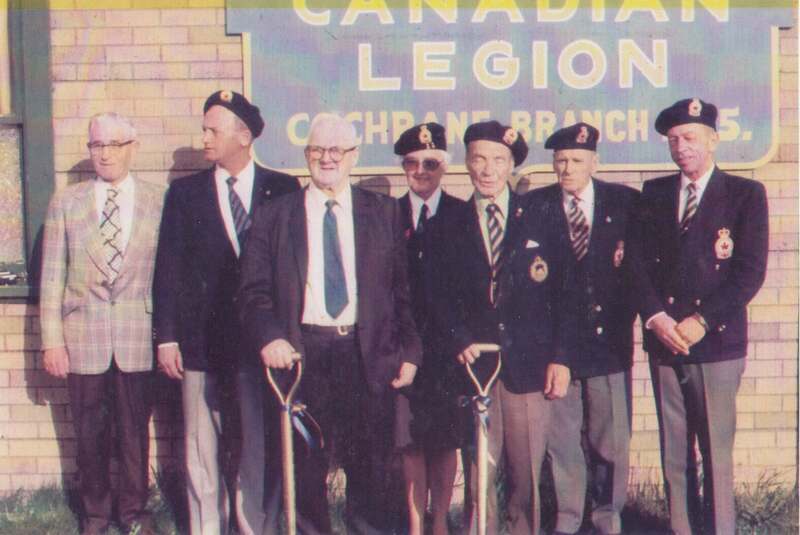 Opening of the Original Legion. I will update this post after doing further research. Right now, we want to get this request out. 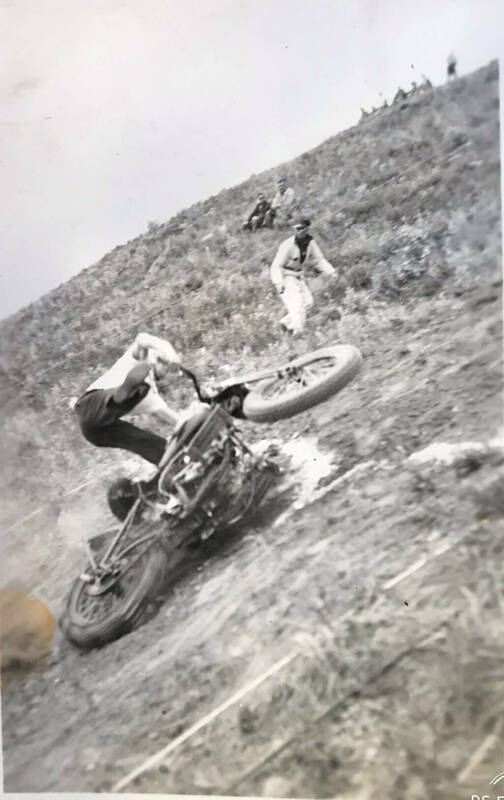 CHAPS is collaborating with ACE HY Motorcycle club of Calgary to explore the history of motorcycle hill climbing in the Cochrane area. 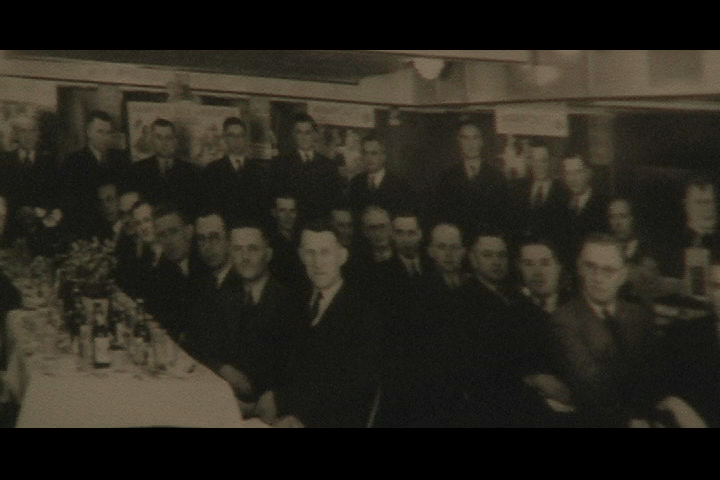 We’ve met to review club photos to identify local land marks and will soon do the same with club movies. Our progress to date has been documented in an article in the Cochrane Times. We’ve found some beautiful photos of one hill climb on Cochrane Hill. Last Friday we ran this quiz. Do you know what these local pioneer terms mean? 1. Anti-I-over A favorite team game at country schools, which involved catching a ball that was thrown over the schoolhouse. 2. Bee. 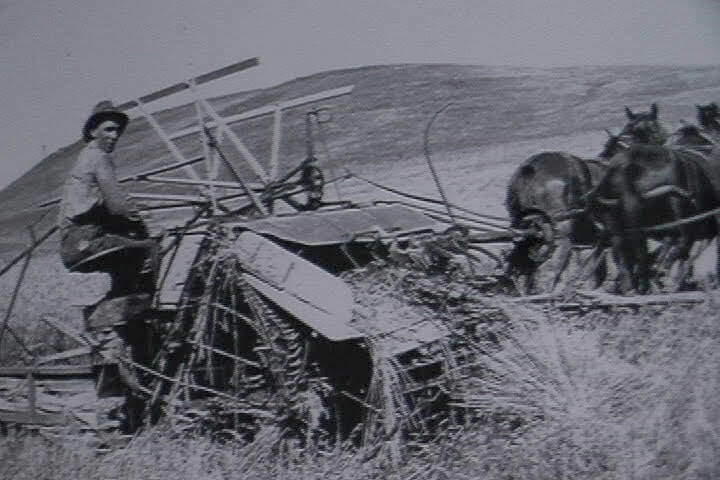 A co-operative effort by the neighbours to get a job done quickly, such as seeding or harvesting the crop of a settler who was ill, or constructing a barn or community building. 4. Broadcast. To throw seed from the hand for dispersion in sowing. Many settlers seeded their first crops in this manner. 5. Buffalo Chips. Dried buffalo manure used for fuel when firewood was unavailable. 6. Bull Durham. A very fine cigarette tobacco sold in a small red and yellow sack with a draw string. Cowboys usually catied the sack in a shirt pocket. 7. Scrip. A certificate or coupon given by the government to certain settlers, entitling them to land. 9. Remittance Man. 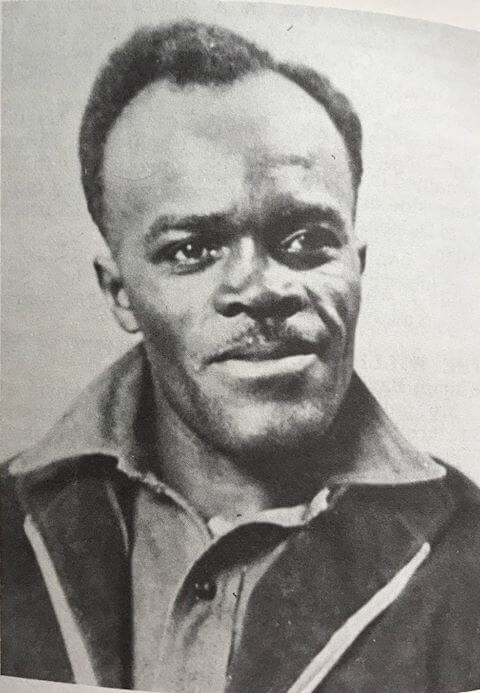 An immigrant, usually from Britain, who received a regular allowance or remittance from home. 10. Rubbering . Listening in on the neighbours’ conversations on a party line telephone. I overheard someone ask this question at our Photo opening the other night. I never noticed the characters on this sign before nor do I know what they mean. We’re asking all those puzzle masters out there to help us solve this one! Contacts on Twitter have provided a partial answer to our question about the language on Bob and Alice Graham’s Pharmacy sign. We want to share our “Why” with you. I prefer to have other peoples perspectives but I’ll share a couple of my own first. 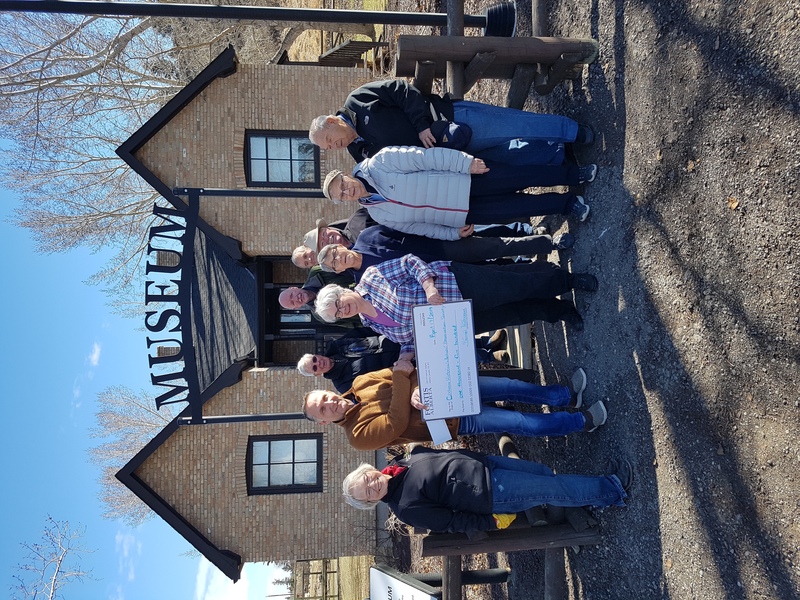 20 years ago, a volunteer group of people concerned with saving the history of Cochrane started the Cochrane Historical & Archival Preservation Society. 5 years ago, CHAPS opened the Cochrane Historical Museum. This scope of this one project amazes and motivates me. CHAPS saved a historic building, fund raised, co-ordinated with several levels of government , had it moved to a wonderful location and had the building restored as a Museum. Truly Inspiring. A dedicated, core group of volunteers has been keeping CHAPS active for 20 years. We are in need of help. We need to expand our membership, our influence and our volunteers. In the next year, I want to interview a number of our volunteers and get their perspective on being involved in CHAPS. Stay tuned. I hope you are asking yourself how I can help. I have a few ideas that don’t cost a lot of your time or money. share and comment on our social media posts with your friends. We want to share our core message of saving and educating about our history to be spread widely. We’re seeing a massive swing lately. Help us keep it going! Like our pages. 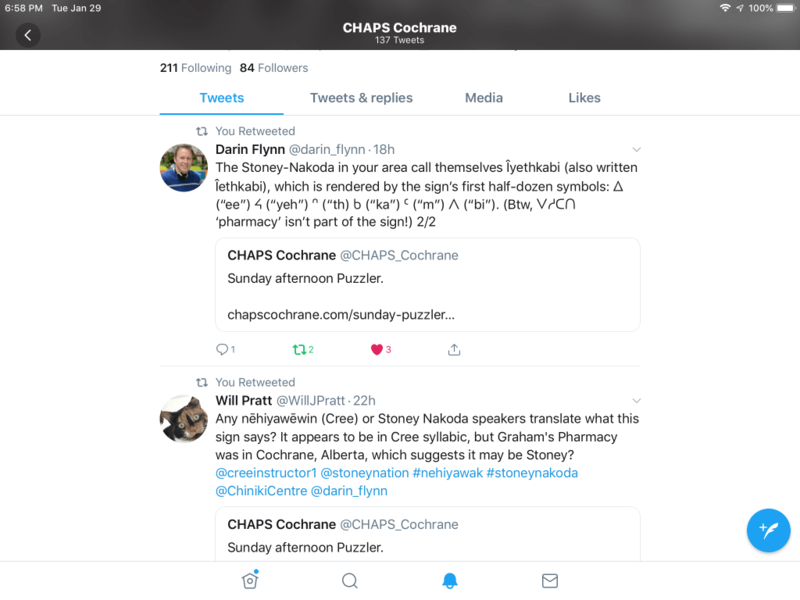 CHAPS Cochrane and Cochrane Historical Museum have pages on Facebook, Twitter, Instagram & Youtube. I’ll be adding social media icons to our webpage soon to help you find and like our feeds. Become a member. It’s super inexpensive. $10.00 a year for an individual, $15.00 for a family. Here’s a link to our Member page. Attend one of our meetings. We are having more and more educational meetings. Stay tuned to our events webpage for updates. Donate to CHAPS to help us fund our projects. We have a Donate button on the top right side and bottom of our webpages. Our CHAPS Facebook page is running a fundraising campaign until the end of March. They have been hugely successful so far and we can always go over the top. Membership. Help us find new members and stay in touch with existing members. Become a Director. Volunteer now and let your name stand at the September A.G.M. I did, scared me to death but I’m sure glad I did. Research. Get in touch to hear the topics we’re planning. Volunteer at the museum during the summer. Attend or help with our summer time guided tours of Historic Cochrane. to everyone that came out to our Photo Archive opening. Both members who shared stories and 15 excited, interested guests. the support of the local media who have helped us share our message. local admins of Facebook pages who provide a means for us to share. everyone that has shared our message on any of our social media feeds. to our existing members and volunteers. an editorial in the Cochrane Eagle about maintaining our Heritage. an article on CochraneNow about our Photo Archive. Another in the 100 Stories for 100 Years series produced by Barry Thorson. 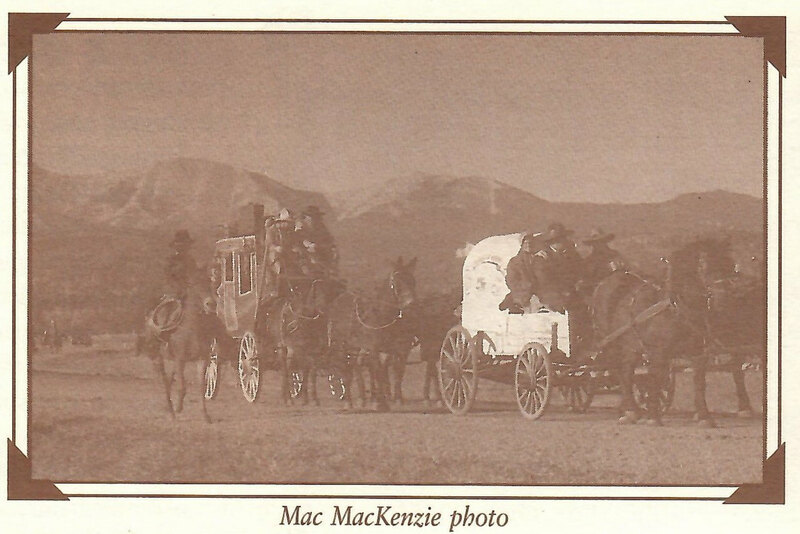 Vernice (Towers) Wearmouth talks about the Brushy Ridge fire and cutter rides from the Ranch to Cochrane to attend dances. 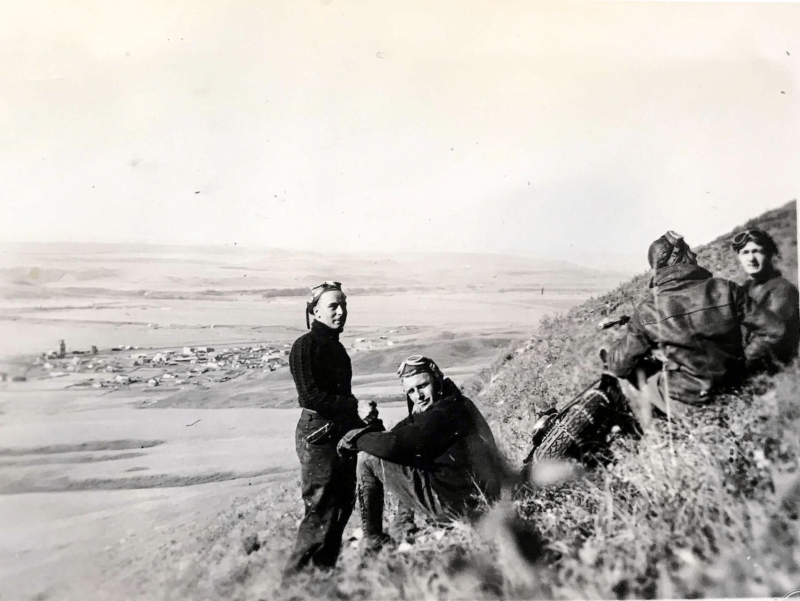 It’s a lovely story from a local pioneer of the challenges and joys of living in the area. Nov 19, 1936 a day remembered by many for years to come. Winds up to 90 MPH (150 kmh) fanned a fire that raced across the prairie. With the gale-force winds driving the fire, there was no fighting it. The year previous had been very dry and the country was dry as tinder. 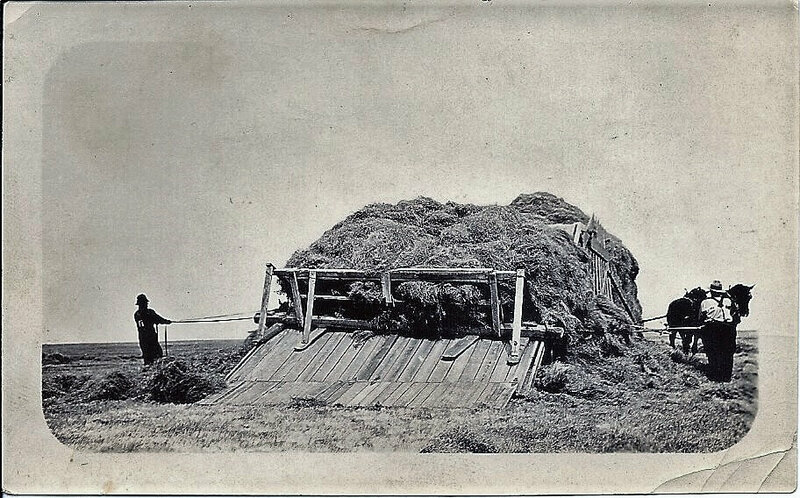 A haystack or field of grass would catch fire and be picked up by the wind and carried a half mile, mile or even two miles only to be set down and start another fire. Then came a shower of rain, bringing a day of living hell to an end. 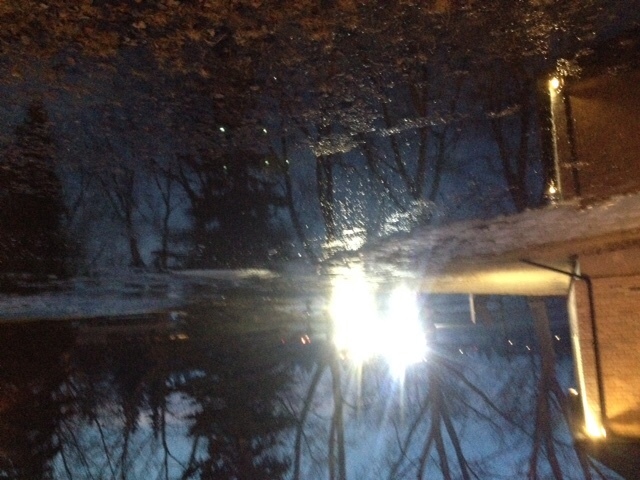 Men had come from Cochrane, Jumping Pound and Springbank to help fight it. Many different methods were tried. George Callaway tried to plow a fireguard in front of it, to no avail. Lennie Blow rode a truck tarp being dragged behind a truck to try and smother the flames that too, was unsuccessful. The fire continued its course and a drop in the wind and a shower of rain were the only things that stopped it from continuing right into Calgary. 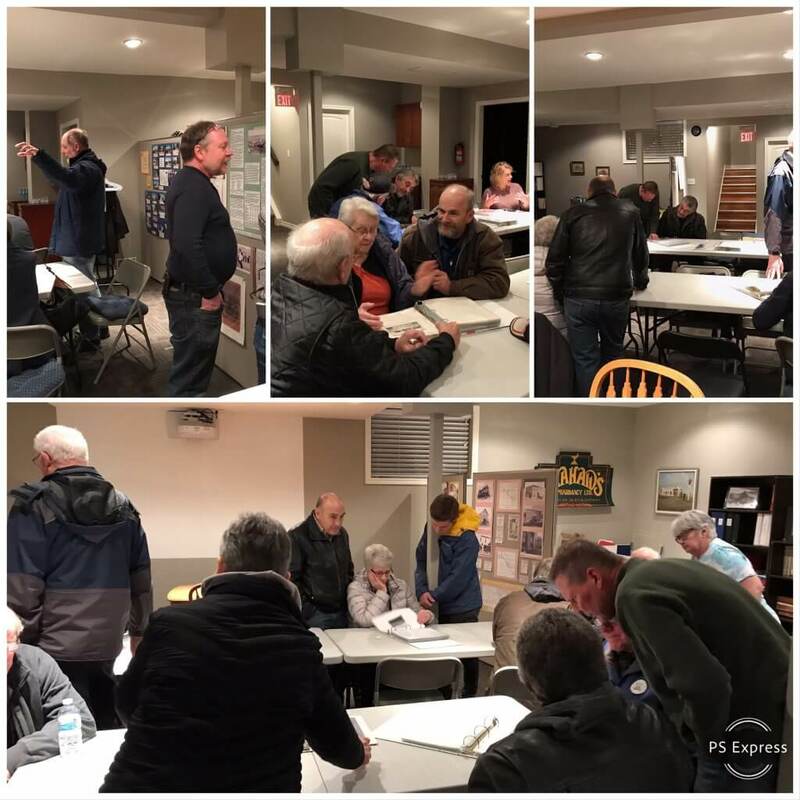 We recently heard from a group doing some interesting work to preserve our history. They asked us to make our members aware. We’re happy to do that. Hi! I’m working with Dr. Peter Dawson at the University of Calgary. 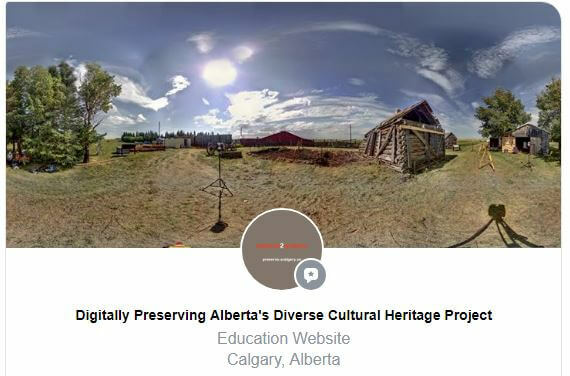 We have recently made a Facebook page to help share our digital preservation work in Alberta. I was wondering if you would be willing on sharing our page to your group? We thought many of your members might find the content interesting, especially as we continue to grow over the next few months! From tent rings and bison jumps to large scale industrial structures, Alberta’s heritage resources reflect our collective histories. 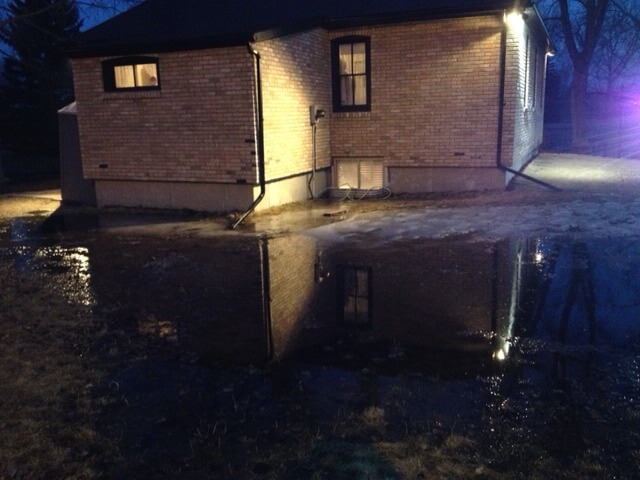 Wildfires, flooding, vandalism, and development continue to place Alberta’s heritage at varying degrees of risk. Reality capture technologies like terrestrial laser scanning (TLS) and aerial photogrammetry can be used to digitally capture and preserve provincial heritage resources. An archive has been created as a repository for these digital data sets so they will remain accessible to future generations. Learn more and keep updated by following the project's Facebook page here! Here’s a backgrounder that mentions some work they’ve done on the McDougall Church. 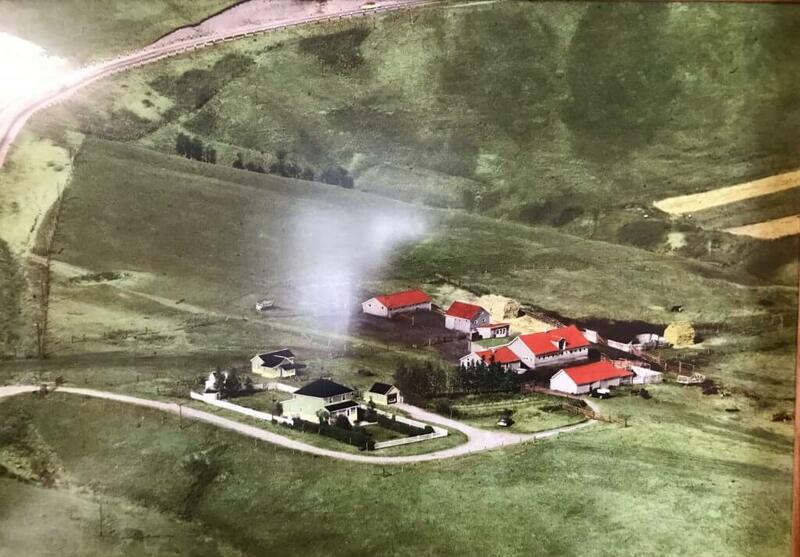 Here’s an update from their website with a visualization of the Perrenoud homestead. 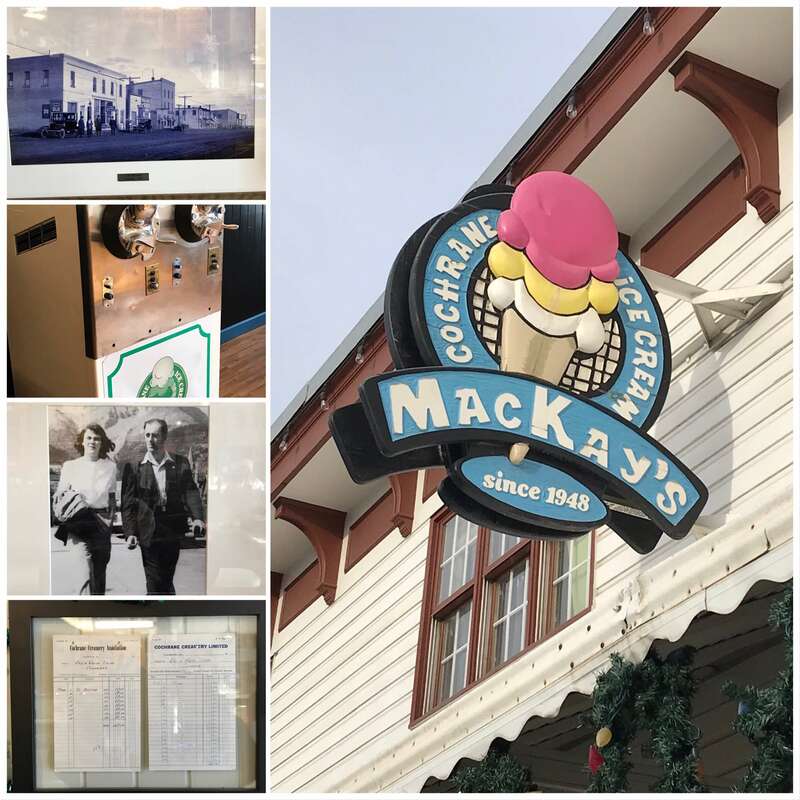 No matter where I’ve lived, whenever someone learns I’m from Cochrane, they mention Mackay’s Ice Cream. 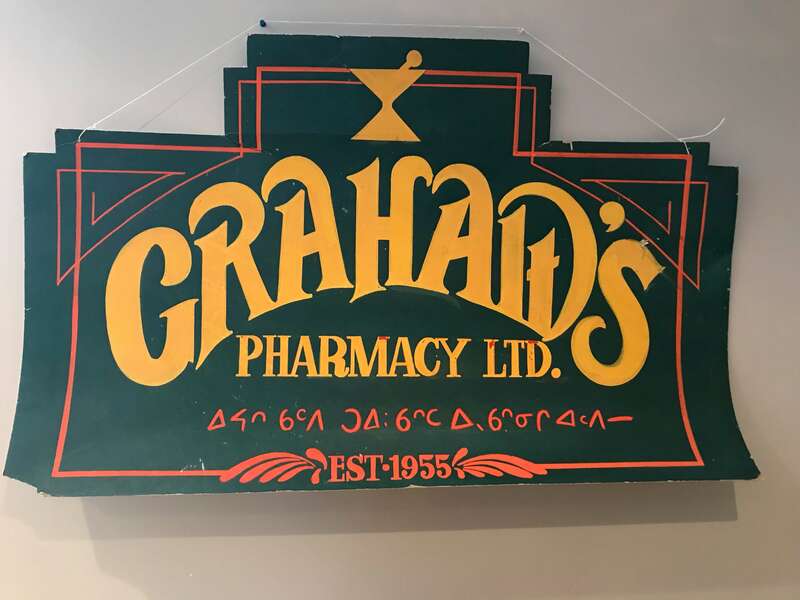 This video from the 100 Stories for 100 Years series features Chris, Heather, Rhona and Robyn Mackay talking about their family, growing up in Cochrane and this famous local business. James (Jimmy) served overseas with the Canadian Armed Forces in World War II. In 1946 he married Christina (Chris) Beck who was born near Glasgow, Scotland , and he and his bride returned to Cochrane. Jimmy and his wife operate a general store, which was formerly owned by F.W. Maggs. For the past 15 years they have been making and selling ice cream. Chartered busses on tours make a point of stopping in Cochrane so their passengers can buy a cone. People have sent papers published from around the world, complimenting them on their ice cream. Jimmy and Chris have made an interesting scrap book of them. They make every flavor their imagination can come up with, even confetti ice cream for weddings. Their cardboard ice cream cartons are designed of dark, green plaid the Mackay tartan. in 1971 they started a guest book which now contains signatures of people from many parts of the world. 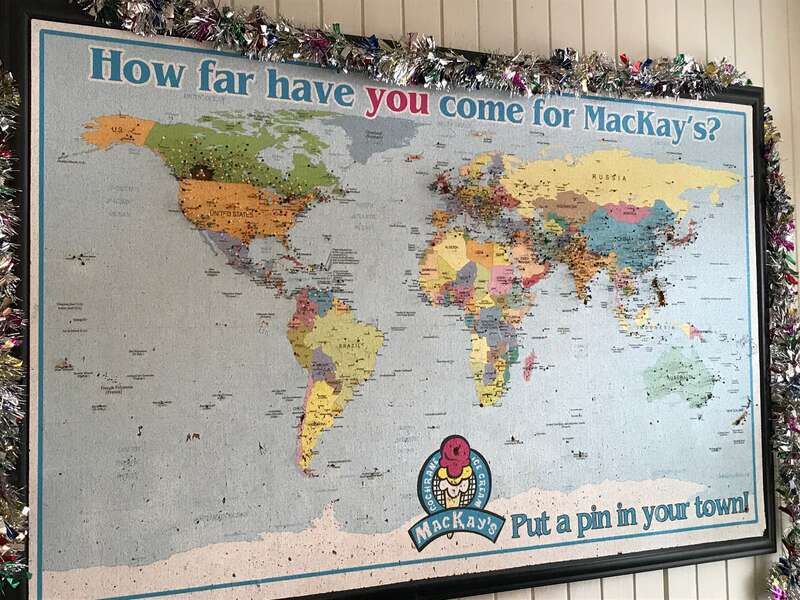 They also have a map of the world on a wall of the store and a thumb tack is placed on every country the guests are from. Mackay’s has a great history wall along one side of the interior of the store. There are photos of early Cochrane, Chris and Jimmy Mackay, and receipts from long ago. Also the ice cream machine that’s visible in the video. We believe the features under the roof line behind the MacKay’s sign are original to the building. Most commented on photo on our Facebook page. CHAPS is planning on having regularly scheduled events to talk about the History of Cochrane and area. This is our first where we plan on opening up our photo archives. We have many more photos than what we’ve been showing on our social media feeds. Plan on joining us for this free event. Stay tuned for a new magazine debuting in February 2019. CHAPS and the Cochrane Historical Museum will be a feature. Existing publications in Cochrane and Airdrie will be merged into a new magazine called “townsizing”. 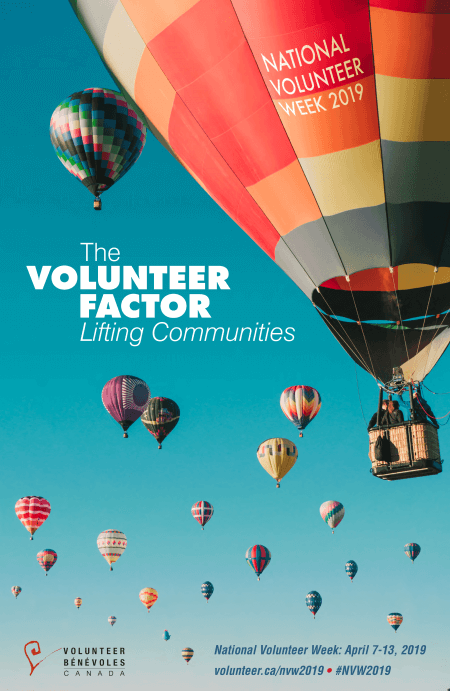 Bernice, Larry and myself had the opportunity to talk to Carmen about our passion for the history of our town and the spirit of volunteerism that our volunteers exhibit that keeps the Museum and other projects going. 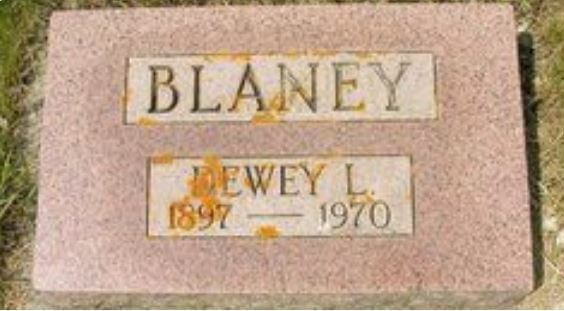 Dewey was born in Roanoke County, Virginia in 1897. He moved with his parents, brothers and sisters to Salem, VA in 1906. He was hired to work for the Barnett family in their home and feed store. 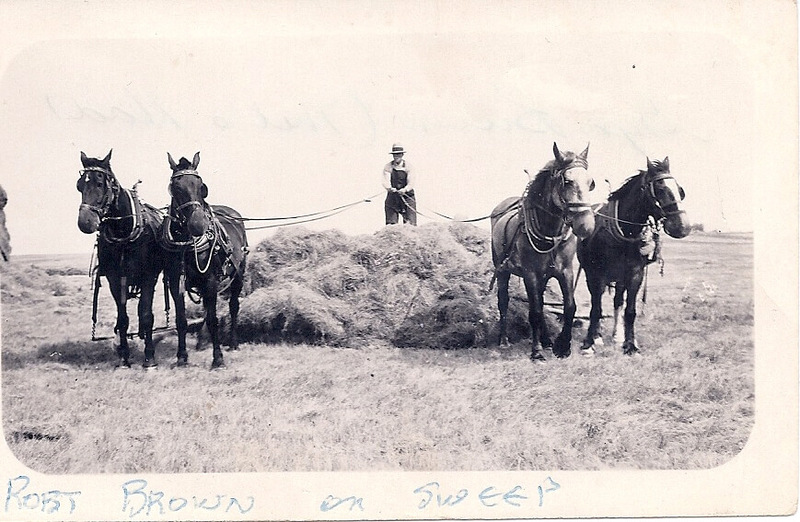 Dewey came to Alberta with the Barnett’s in 1915 to a farm in the Bottrell area. He worked for them for 4 additional years before moving on to work in Dog Pound and Bottrell area. Later, he found work with the Hogarths tending teams of horses on the Banff-Jasper Highway construction and again with local ranchers in the Cochrane area. Dewey loved children and as Ivan in “Skippin’ Sugar Cookies”, says spent a lot of money on them. 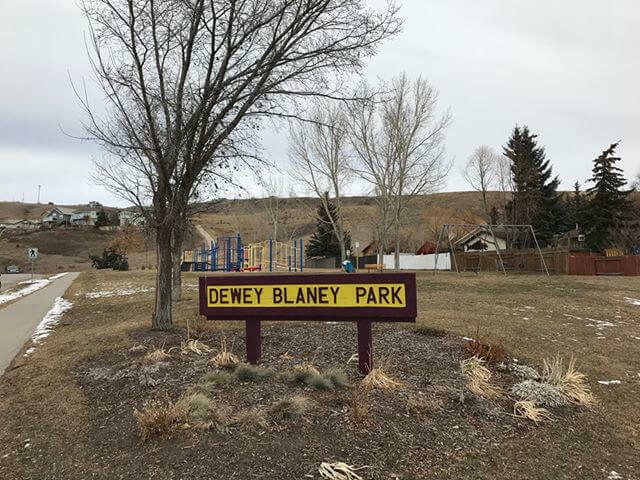 Dewey passed away in 1970 and is remembered here in Cochrane in St. Andrews Cemetery and Dewey Blaney Park. Long after Dewey passed away he inspired me. He was around Cochrane alot when I was small and I also saw him at the Cochrane Racetrack site where he lived. 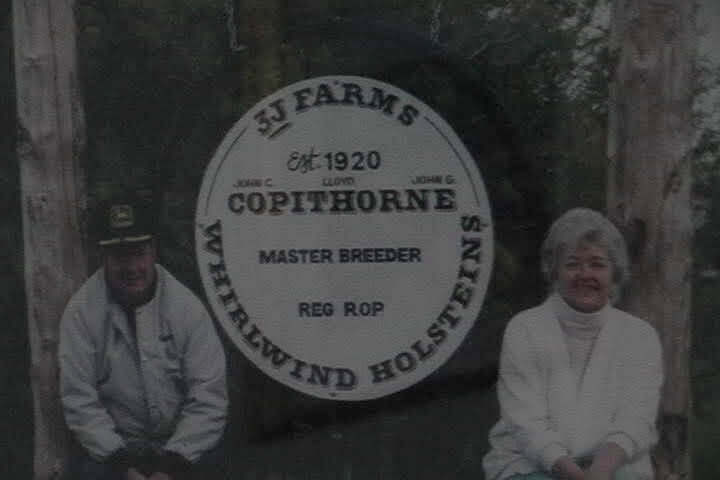 He worked for many ranchers in the area including my grandfather J.W. (John) Boothby. Dewey inspired my interest in history. I read in Big Hill Country that his grandfather was a slave. That small piece of information made me realize that the Civil War and slavery were not long ago even though 1861-65 sounded so many years passed. That small fact also made me realize that the study of history helps understand why we are the way we are today. CHAPS premiered a new Exhibit at the Cochrane Historical Museum. A unique Canadian Red Ensign flag was unveiled at the Museum today. The flag was donated by David and Jane Raymont of Toronto who have familial ties to the area. Mr. Raymont purchased the flag in memory of local rancher Arthur Scott Lewis who died in W.W. 1 (1885-1918) He and his wife Maude Lewis, purchased a section of Spencer Creek Ranch (Beaupre Lake area) in 1908. Alberta became a Province in 1905 and the shield of Alberta was added to the other 8 shields on the right hand side of the Red Ensign flag in 1907. The Union Jack was on the left side, so this flag represented all 9 provinces and England. This Red Ensign, or similar one would likely have been flown in Cochrane with great pride after Alberta became a province. It is therefore very appropriate that this flag will be prominently displayed at the Cochrane Historical Museum. After the flag was donated it became clear that this was an important acquisition that should be restored, preserved and given pride of place in the Museum. 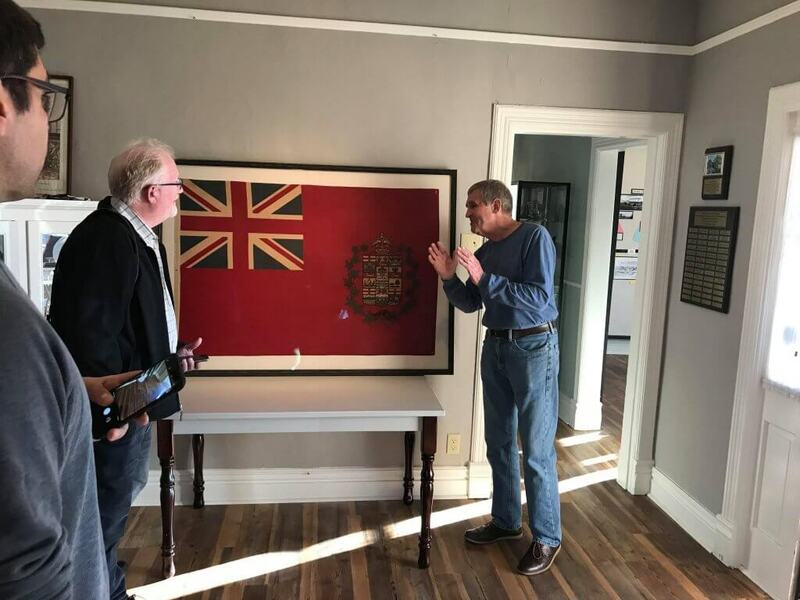 Thanks to a generous grant from the Rotary/Lions/Bow Rivers Edge Campground Society, the Museum was able to have the flag cleaned, repaired, mounted and framed. 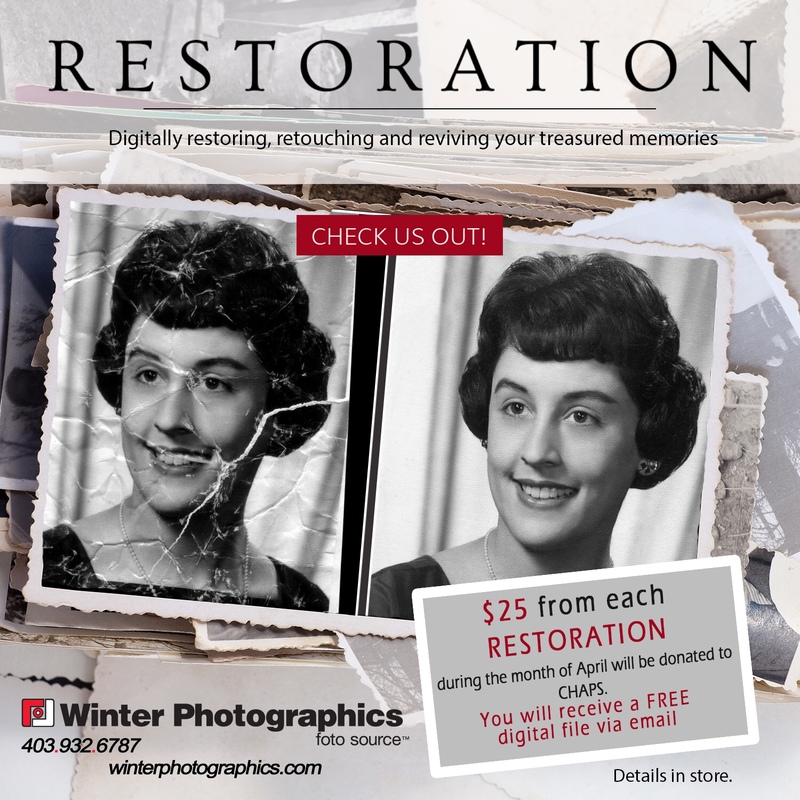 The meticulous work of professional restorer Gail Niinimaa and the painstaking framing of Scott Winter at Winter Photographics has restored, preserved and beautifully displayed this unique acquisition. Despite the Canadian Red Ensign never being officially approved by Ottawa, it flew over the Parliament Building for several years before being replaced by the Union Jack during the Boer War. Flag manufacturers capitalised on nationalistic feelings and produced several different varieties of Red Ensigns, adding the new Provincial Shields when they were approved by England. The Museum’s flag, like others has the Union Jack on the left and the provincial shields on the right, but unlike most Red Ensigns has a maple leaf and beaver garland around the shields, making it rare and truly Canadian. Since the ‘Great Flag Debate’ of the 60’s when Canada finally acquired its own officially approved flag, little has been heard of Canada’s original flags. The history of the Red Ensign is in danger of being lost. In their lifetime, many Canadians have only known the current flag, and its a revelation for them to see an original early Canadian flag. The museum will be showing this history along with countless other exhibits when it opens again in June 2019. Mike Taylor, Cochrane Historical Museum Committee member. 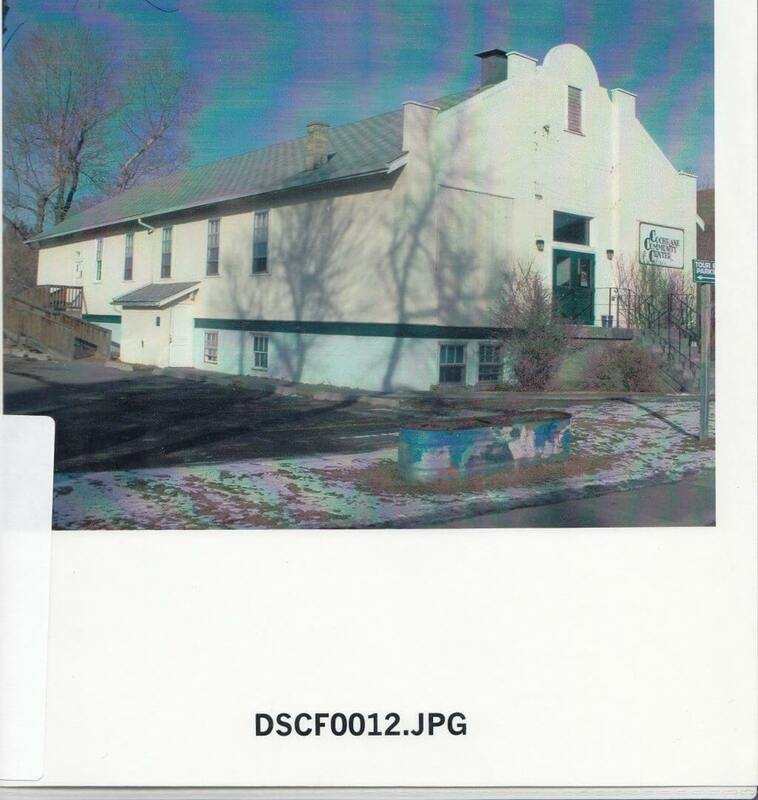 The museum is a part of CHAPS, Cochrane Historical and Archival Preservation Society. Gordon and I spent an hour trying to locate 1 of the 3 motorcycle hill climbing areas around Cochrane. We think we’ve found 1. These images are approx. 80 years apart. Do they look like the same plateau and corner of the river? 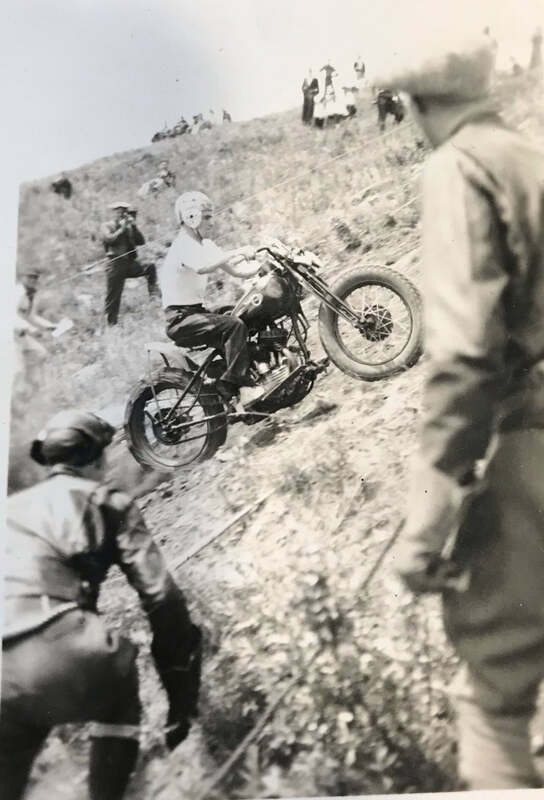 We are meeting with Ace Hy Motorcyle Club later this month to see their photos of 1930’s hill climbs to see if we can find the other 2 sites. Hamish McNaughton Kerfoot talks about how he and his father got to the ranch on Grand Valley Road. CHAPS wishes everyone a joyful, peaceful, loving and Merry Christmas. 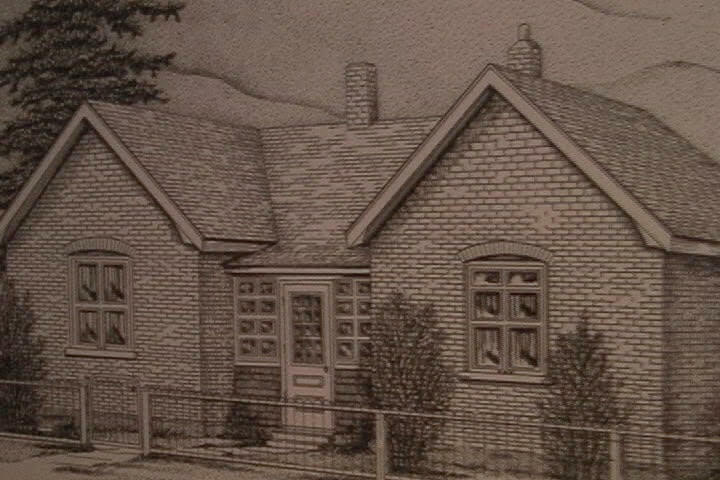 Our gift to you are some memories of Historic Cochrane from our new Youtube site. Please Subscribe and Like our Youtube channel. Look for this button in Youtube. We’d like to see you at our Christmas celebration at the Museum December 17th, 7:00 PM.